But in all seriousness, John has a vast repertoire that he wishes to conduct. Not just the standard repertoire, but also music that deserves to be heard, and not just on recordings or in some concert hall in Europe. He has been invited by the likes of the Colorado Symphony and the Detroit Symphony, but on one-off concerts, so why hasn't he been invited by these major orchestras, and others, on a subscription series? Now in recent months many people have asked "who is that wonderful black conductor we see on the GMC commercial?" 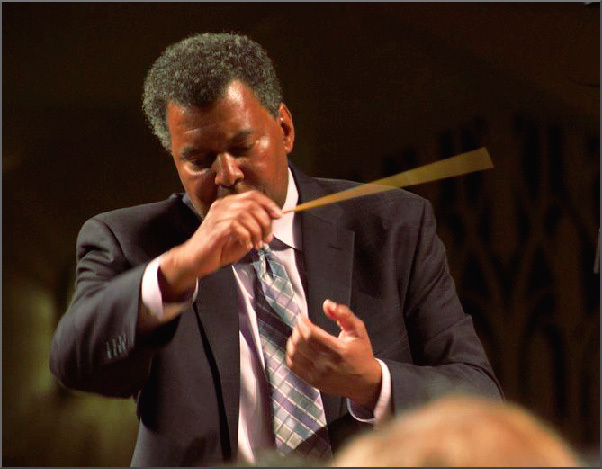 and the answer is Kazem Abdullah, but apart from a gig with the Westchester Symphony last June, and a recent appearance by the Detroit Symphony performing, among other works, Jeffrey Mumford's cello concerto, he has, to my knowledge, not been invited to conduct major orchestras here for the '17-18 season. This also applies to Kirk Smith who, if you have read some of my posts and his, has recently made a recording of works for string orchestra by American composers (this one included :) ), but apart from an appearance with the Houston Symphony last year, I don't see American orchestras clamoring for his services. Now...as Bob hinted, if DGG can sign what they say is their "first female cellist" and wish to "exploit" her, then why isn't a major label hooking up with some of these conductors to grant them the exposure they deserve? Is it because they don't want to break the glass ceiling and show the world that black conductors are capable of performing both the standard repertoire as well as new music? Are they afraid that they don't know how to "market" them? First - we need to be seen as conductors, period. The color should not matter whatsoever, but for those who have made up their minds that black men and women should not hold grace at the podium because...well, this music is not a part of our history, we beg to differ. Second, there are many of us who are guardians of this music and defenders of its faith, and in some cases even more so than one is led to believe! Third and last...because audiences seek new faces, and we are the makers of generations to come and to aspire them to explore this vast repertoire of music.